I'm sure many of you were helping your children work on their Valentines for Tuesday this weekend. 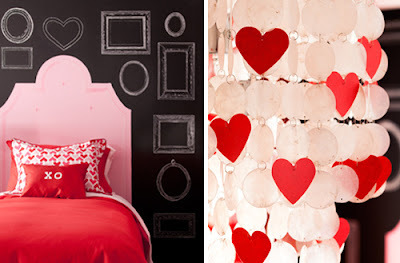 Well here is a room designed by Jennifer Brouwer featured on Coco & Kelly last week which is truly the epitome of the Valentine's spirit. And yes those headboards are just painted onto the chalkboard wall! Not particularly high on the comfort scale but it looks great and is inexpensive. love pink and red together! working on my daughters big girl room and pink and red is our theme.